If we are supplying our own kayak or SUP, can we leave it at the race site the night before the race? Yes, there will be overnight security on Saturday. Saturday drop off time: 3-6pm. Sunday: 6-8am. Drop off your kayaks or SUP at your own risk on Saturday. Temporary drop off location can be found HERE for 10min. Is Morro Bay safe to swim in? We schedule the race around the tides making sure the swim takes place during a “slack tide” – meaning you will not be sucked out or pushed in. If you would like to train in Morro Bay please check the tides first, and watch out for boats. For tide charts please CLICK HERE. We will be having pre-race weekend clinics to get you familiar with the course. Consider attending! It looks like you run on the beach, what is the sand like to run on? Yes, half the run takes place on the beach. The majority of the beach is hard packed sand, similar to the dirt road. There are a few soft sand sections plus some rocks on uneven terrain thrown in for good measure. You have been warned 🙂 We will be having pre-event weekend clinics to get you familiar with the course. Consider attending! Will the bike course be closed? We will have a lane closure on HW1 between Morro Bay and Cayucos. Please be aware of cars! We will be having pre-event weekend clinics to get you familiar with the course. Consider attending! Is your registration site secure? Yes, we use Active.com to register you for our event. They are 100% secure. May I give or transfer my slot to someone else? Yes, you can do so by editing your registration information through the registration website. The last day to do this is Sunday, October 28, 2018. How do I know when my wave starts? This information can be found on the Event Day Schedule page. Are there designated transition spots? No. Your transition area spot is first come first serve. Better get to the race site early to secure your spot! Transition area opens at 6:00 a.m.
Will there be body marking? Yes, you will be required to get body marked before your race. Look for a volunteer in the transition area with a black Sharpie marker before your put your wetsuit on! Do I have to source my own swim cap? Where on my body will I get body marked? Your bib number will be Sharpied vertically on the right side of your right calf and your left arm. Your age will be on the back side of your left calf. What are the distances for the Morro Bay Triathlon? What is the order of a triathlon? Swim(or kayak/SUP), bike then finish with the run. 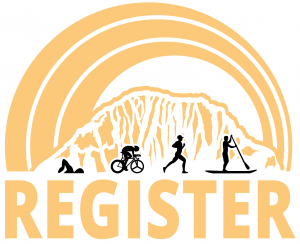 Is Morro Bay Triathlon a USAT sanctioned event? Yes it is! There will be USAT officials monitoring rules. No. This is a non-drafting triathlon. There will be USAT officials monitoring the bike courses. There will be time penalties for drafting. This is an open course you will need to obey all traffic signals and signs. Are cell phones and music allowed on course? What product will you have on-course? Will there be photos available? Yes! Finish and on-course photos will be available for purchase at the event and after – you will be emailed a link. The expo area is pet friendly, however you may not participate with your pet. Sorry!